Transit Only was put together by singer/songwriter Micah Thompson and Piano player Kris Hughes, in late 2008. In November of 2008 the Ep-Lets Make a Truce was recorded at the Piano Studio, Seattle by Martin Buff and was mixed by Alex Rose, member of Minus the Bear and Model Photographer. Album was mastered by RFI, Seattle in late January 2009. Guitar and Vocals: Micah Thompson. RadioIndy is pleased to present Transit Only with a GrIndie Award for the CD "Let's Make a Truce "
Sit back and enjoy the relaxing ambiance of “Let’s Make a Truce,” Transit Only’s latest release. This duo performs with laid back vocals complemented by guitar and piano. Feel the chemistry between these two musicians as they carry out dreamy, easy listening arrangements. Vocals are soft and tender, which blend with the heartfelt lyrics. “Parachute Boy” mingles the vocals and instruments with graceful style. “Bye, Bye Baby” moves up in tempo and has a nice strumming guitar, while the piano helps maintain the balance of this tune. If you are looking to hear some ideal mood music, then check out Transit Only’s “Let’s Make a Truce,” especially for listeners who are a fan of John Mayer or Augustana. "Let's Make a Truce" Reviewed by RadioIndy.com! 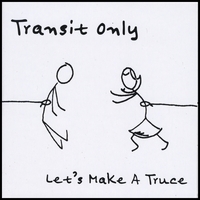 RadioIndy Present the New Release: "Let's Make a Truce"
RadioIndy is pleased to announced that we have published our CD Review of Transit Only music to Facebook. FANS - Please checkout Transit Only iTunes page play / purchase some great new music! RadioIndy is pleased to announced that we have published our CD Review of Transit Only music to CD Baby. FANS - Please checkout Transit Only online! RadioIndy created a CD Announcement Press Release for Transit Only on Digg.com!